The average cost of assisted living in Greensburg is $3,570 per month. This is higher than the national median of $3,345. To help you with your search, browse the 1 review below for assisted living facilities in Greensburg. On average, consumers rate assisted living in Greensburg 5.0 out of 5 stars. Caring.com has helped thousands of families find high-quality senior care. To speak with one of our Family Advisors about assisted living options and costs in Greensburg, call (855) 863-8283. Greensburg is a small Indiana city where senior residents enjoy shopping for antiques, traversing peaceful walking trails and admiring the famous trees that grow at the top of the historic Decatur County courthouse. Greensburg is home to over 11,000 residents, and about 15.5 percent are age 65 and older. Two licensed assisted living facilities in Greensburg cater to this senior population. In Greensburg, as throughout Indiana, assisted living communities are known as residential care facilities (RCFs) and are licensed by the Indiana Department of Health. The cost of living in Greensburg is 19.2 percent lower than the national average and about 13 percent lower than the average throughout the state of Indiana, which can help reduce overall living expenses for seniors on a budget. The state of Indiana doesn't tax social security benefits, leaving more money in Greensburg seniors' budgets. The Greensburg area is home to world-class medical facilities, including Decatur County Memorial Hospital, in the event of medical emergencies or illness. Greensburg has distinct seasons with variable temperatures throughout the year, including an average of 14 inches of snow annually. Seniors considering an assisted living community in Greensburg should ask about how the staff keeps residents comfortable throughout the year. Crime in Greensburg, including property crime and violent crime, is lower than the average crime rate for the U.S. The generally safe setting can provide peace of mind for seniors living in Greensburg. The local Arts & Cultural Council in Greensburg occasionally hosts art classes and events that interested seniors may enjoy, and the Tree County Players community theater group puts on regular small-scale performances. Greensburg is about one hour from both Cincinnati, Ohio and Indianapolis, Indiana, providing potential day trip opportunities for local assisted living community residents who are interested in arts and culture to go see plays, visit art exhibits or attend performances. Assisted Living costs in Greensburg start around $3,570 per month on average, while the nationwide average cost of assisted living is $4,000 per month, according to the latest figures from Genworth’s Cost of Care Survey. It’s important to note that assisted living rates in Greensburg and the surrounding suburbs can vary widely based on factors such as location, the level of care needed, apartment size and the types of amenities offered at each community. 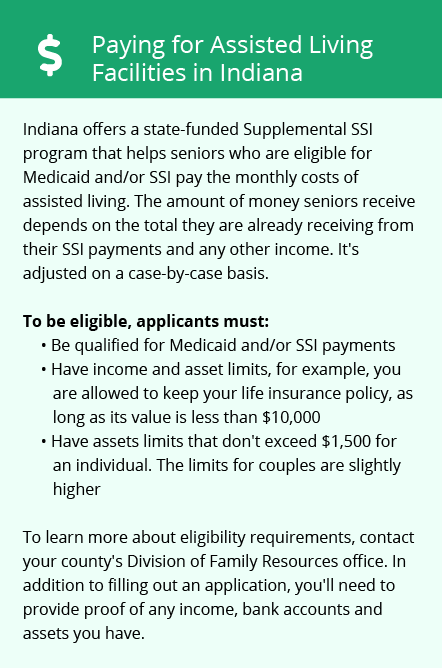 Greensburg seniors covered by Medicaid in Indiana are eligible for the Aged & Disabled Waiver program. One option in this program includes assistance with payment for assisted living. 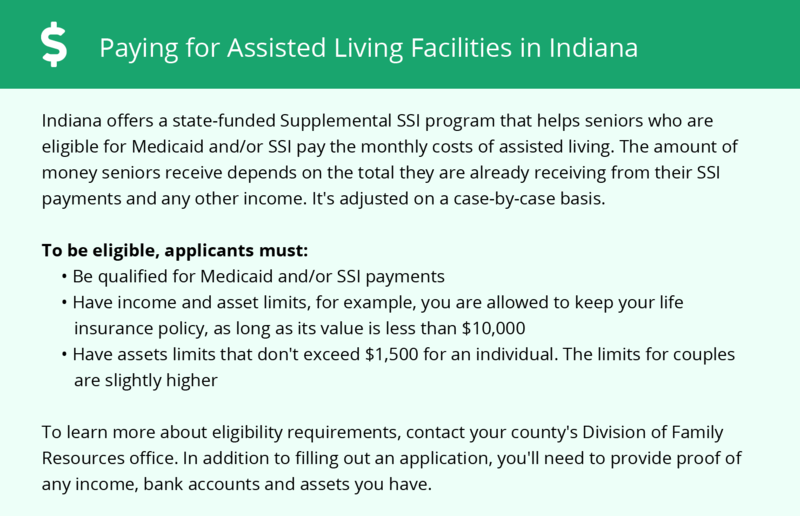 Seniors in Greensburg who are not covered by Medicaid may be eligible for the Indiana Residential Care Assistance Program, which provides funding for room and board at specific licensed residential care facilities. Because not all facilities participate in this program and assisted living facilities may enter or leave the program at any time, check with the community you are considering to determine current participation. Greensburg and the surrounding area are home to numerous government agencies and non-profit organizations offering help for seniors searching for or currently residing in an assisted living community. These organizations can also provide assistance in a number of other eldercare services such as geriatric care management, elder law advice, estate planning, finding home care and health and wellness programs. To see a list of free assisted living resources in Greensburg, please visit our Assisted Living in Indiana page. Greensburg-area assisted living communities must adhere to the comprehensive set of state laws and regulations that all assisted living communities in Indiana are required to follow. Visit our Assisted Living in Indiana page for more information about these laws.